Net Entertainment is one of the more innovative companies that is involved with the business of producing high-quality games for the online casino market. And now these two outfits are getting together to bring these games to a new audience. NetEnt, as the Swedish-based company is better known, has demonstrated the ability to design and develop games that are rich in graphics and are among the most user-friendly available. They have developed a number of winning themes as well; one of them was the Scarface slot, which rolled out early in 2013. Coupled with a South Park slot game that came out in the latter part of the year, these were very big winners for the company. NetEnt's mobile Touch games come first, as they have already been launched, with desktop games to follow. 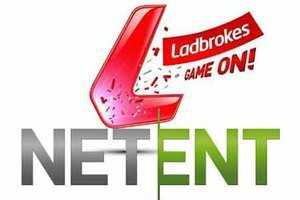 The plan is for the games to rolled out gradually, but the anticipation is that the Ladbrokes audience (the company is based in the UK) will take very strongly to the NetEnt product, so this introduction could be more rapid that originally thought. Björn Krantz, Chief of GMO and MD Net Entertainment Malta Ltd., says "Over the past year we have increased our presence in the UK market to continue our strategy of developing solid and long-term business growth alongside our global gaming partners." Net Entertainment not only produces the games themselves, but also a complete management platform that those games on. The company is publicly traded on the Nasdaq OMX Stockholm, under the symbol NET-B.